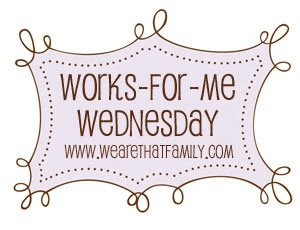 This week's Works For Me Wednesday is a backwards edition where I get to ask YOU a question...but more on that in a minute. Remember a few months ago, when I asked if you would take a survey for me to get to know you better? Well, I was just blown away with the number of responses and I want you know know that I LOVE YOU GUYS! ...and only 14% of you said Jon Hamm. 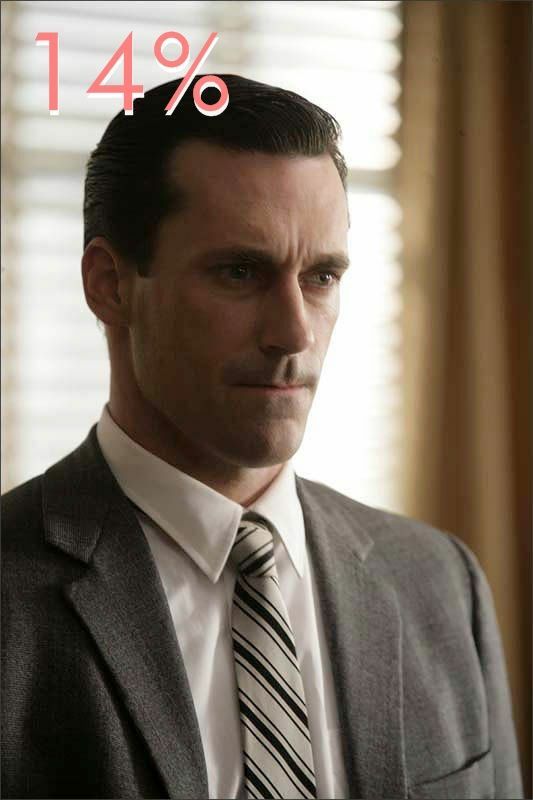 Ladies, and all 7 of you guys out there, please let me introduce you to a little show called Mad Men. We are watching the episodes through NetFlix and are absolutely hooked. "Jon Hamm eating a cupcake"
Well, here you go, honey...this was the best I could do! What cookie decorating questions do you have? Are you having issues with certain steps of decorating? I don't have all the answers by a long shot, but I might have a few. I'll answer your questions in a future WFMW. Leave a comment here or feel free to email me by clicking on "contact" at the top of the page. I am still looking for the perfect sugar cookie recipe--I've tried about 25 and some are pretty good, just not "WOW"! Also, do you ever add anything to your royal icing to improve the taste (lemon juice, almond extract....?). 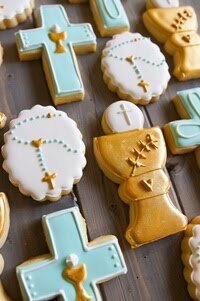 I love the look of flooded cookies but don't like the taste of straight royal icing. Okay, this is my favorite post ever. 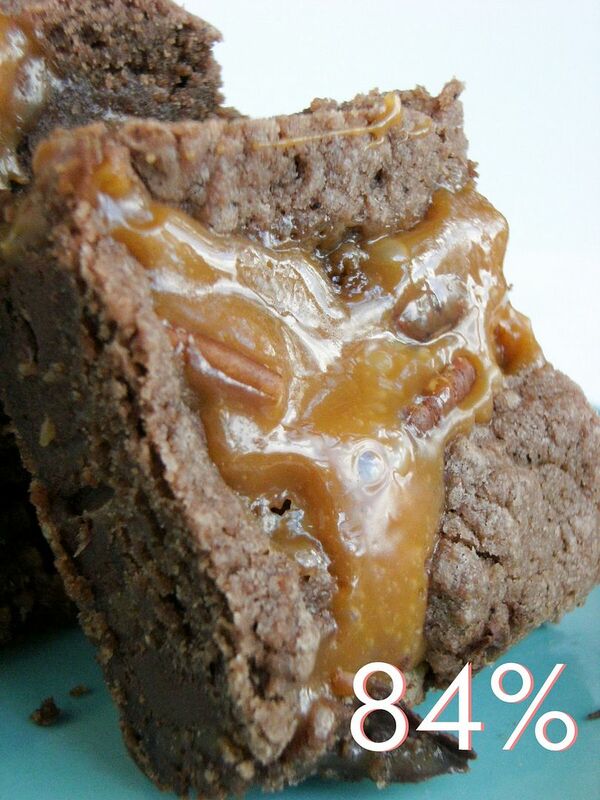 And not just because I'm duel drooling (cookies and a hunk)! Every time I make sugar cookies (which is not as often as YOU) the main thing I taste is flour...I can't find a good recipe that is both yummy and easy to cut out with. Oh how exciting...I get to ask the ever so famous Miss Bridget my very own question...let me see. Well...what comes to mind is this. why does it dry up and just fall off in little bits. It's almost like it just wasn't glued down good enough. Oh I do adore being able to ask a question...and I will be polite and hold my questions to just ONE! Now...about that 10 lbs you want to loose before doing a video tutorial...that is tooooooo funny Bridget! Your personality is just tooooo adorable! Which is sure to rank your COOKIE book into the TOP SELLER list!!!!! oh...your not the only one that wants to loose 10 before being videos! My mid-section feels like a tire right now...since the holidays! I had the laptop propped up on my tummy in the chair! That's why this chic will be waiting it out til next Christmas to whip your gingerbread up! Oooh I love these questions :) I was wondering if you could do a little tutorial on piping around the cookies before you flood them. Mine are always squiggly and not professional looking. And then when you lose that 10 pounds, I'd like to you tell us how you did that by eating cookies. Thanks!! Hmmm, yeah, I can't even us a cookie cutter properly!! How do you cut a nice cookie without using insane amounts of flour? After cutting out your cookies, how do you pick them up without denting or squooshing them? I made snowmen during Christmas and they all ended up looking like they had been in some sort of accident. I love the questions here! I was also looking for a recipe for royal icing that actually tasted good. It's fun for the cookies to be cute, but they have to taste yummy too! I don't have a question. But I do have a comment. Hmmm...perhaps I can put my comment in a question form. I do like following rules. Question: Why do you have to wait until you lose 10 pounds before launching some video tutorials??? Hmmm? Life is short. I'm a visual learner. Please make some video tutorials. Pretty please. Now that I'm in my 40's, I'm finally starting to realize that doing something "when I've lost 10 pounds" or "when I get the carpets cleaned" is letting life pass me by. At warp speed. Don't wait. There. I'm having a bad day and my teenagers laugh at my life advice. So you go it. Sorry 'bout that. I can't find a sugar cookie recipe that I can execute. Half the time I can't even roll it out flat, and then I can't get them from the counter to the cookie sheet. I pretty much fail every time. It makes me sad because we try to do Hanukkah sugar cookies every year, and I want to make homemade, but I always get mad and end up getting the pre-made sheets of dough. HELP! BTW You are amazing for doing this!! I am sure it is about the frosting, but I follow your recipe exactly and the tip size but I can not write names or outline and fill and end up with the results I see here? could i be missing something important? how do you get the icing to not break while writing a name and how do you outline and fill so perfectly? Ok, so I've never made cookies (not like YOU do anyway) in my life, but I drool over your blog all the time and wish I could do it. What is an easy, non-intimidating way to start baking/decorating cookies? 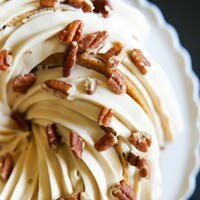 how do you know the perfect consistency for icing when piping as well as flooding? sometimes I think it is too thick for piping and it breaks off when it drys and other times it is too runny. Also, when decorating wet on wet, how do you do it so the colors don't bleed into one another? I like the question before mine. when doing dots etc...so they blend in - how long do you wait before adding dots..so they set at the same height but don't bleed? This seems to happen more when darker colors are dotted on light...like on my dice (on my blog). And I assume you use flood consistency for dots etc. Your blog is awesome...i refer people to it all the time when they ask me decorating questions! in order to pipe the cookies you have to ROLL out the dough...my dough NEVER rolls out well & i always have difficulty...i have tried rolling under wax paper sheets as well as parchment...it is hopeless?...should i move on?...i am so frustrated...because i want to DECORATE! BYW: happy new year to you & your fam...a shining, bright & delicious one! 3) if you make your icing ahead of time - and you refrigerate it (which I've heard if you use meringue powder you can leave it out up to a week) - do you separate into flood and piping then or wait until it's time to decorate? 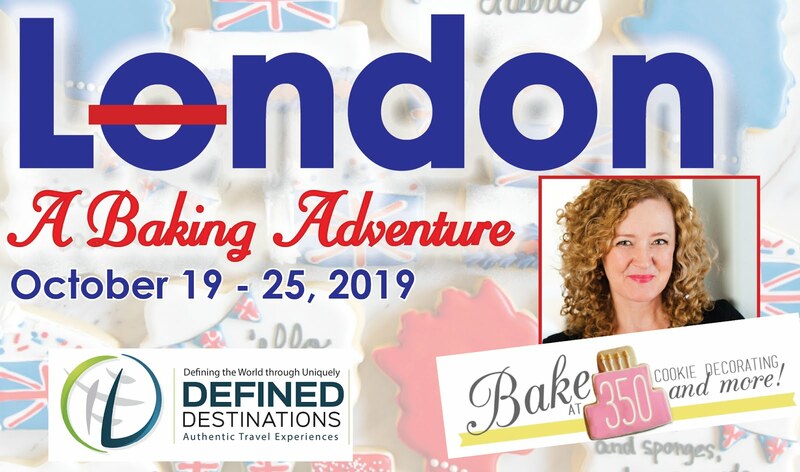 and can I share a tip with some of the readers?---use powdered sugar to "flour" when you are rolling out - your dough wont taste floury - or use wax/parchment paper under or over the dough! Thanks Bridget!! you're da BOMB!! I simply love, love, love your site/blog. I think it's wonderful that you've made it so interactive and that people come to you with their questions. Brilliant!! You are my blogging hero and I want to be just like you someday. 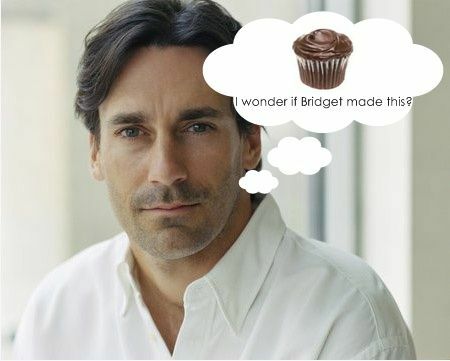 Oh, and that picture of John Hamm and the cupcake just about made me fall off my chair. 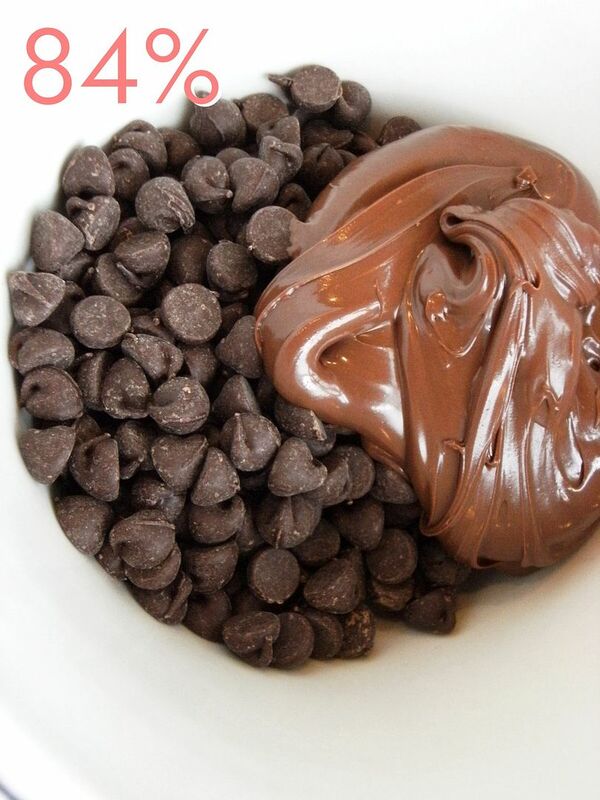 One word ~ YUM!!! questions: how do you get your writing to look so even and not slanted. when i write on my cookies my lines end up looking like slopes, if that makes sense. LOL @ the inclusion of Mr. Hamm. Mad Men is an excellent show. I hope that you will love all of it. I think I've finally gotten the consistency down - 90% of the time anyway, but I notice that sometimes, it gets white spots when it dries, even though the color is mixed in thoroughly. Does that mean it's actually still too dry? I also want to know how you keep darker flood colors from bleeding into lighter flood colors when you put it on top. Thanks! Also, to everyone who asked (if you're interested in advice from a newbie decorator), I use just a touch of almond extract in my icing for perfect flavor. And if you search allrecipes.com for sugar cookies, there's a recipe with a picture of flower cookies in a pot that calls for butter extract - it makes them extra tasty. They also come out perfectly sturdy for decorating. hmm...well, what type of bags do you use? It may be somewhere in the archives but....I am on limited computer time with a 2 yr old at foot! I love your pics too, what kind of camera/lens/lighting to you use? ooops ....too many questions..! Sorry! Ok. Mine might be the only one of it's kind - but, this year I made mittens with red royal icing. so far so good - two things happened. One - once frosted and dried the color became really dull. How do you keep your color so vibrant? and two - my reg mittens developed what looked like grease spots on them as they dried. They didn't feel greasy but they looked like someone had dripped water on them. Any ideas? Thanks for sharing your knowledge. I love and admire your work. I have been trying to make sugar cookies to roll, cut, and ice but I have one major problem-- my dough is always goopy, like a really thick cake batter. Alot of the recipes call for "softened butter", so I usually use the butter than comes in a tub. Do you think that could be my problem? Love your blog! Your cookies look so pretty, and I have yet to attempt my hand at one of your designs. In several of your posts, you say to let the cookie dry overnight. I've always wondered...if the cookie is left out overnight, won't it get stale? This might be redundant, and you might have already gone over it... I haven't looked in the back logs. First, I always decorate my sugar cookies with a delicious cream cheese frosting, nothing beats the taste. But I love how cookies look that are decorated by filling in with a thinner frosting... do you have any idea what I"m talking about? I bet you do. Becuase you can do amazing things with it... but does it taste good? I haven't wanted to try for fear the taste would kill me. Is it like fondant? Not terrible, but certainly no comparison to the coveted cream cheese frosting? What's the solution? Amazing to look at? or Amazing to taste? Happy New Year, Bridget!! As you know, I love your blog, and this post is fabulous!! Thanks for sharing your know-how!! How do you "fill" a cupcake? 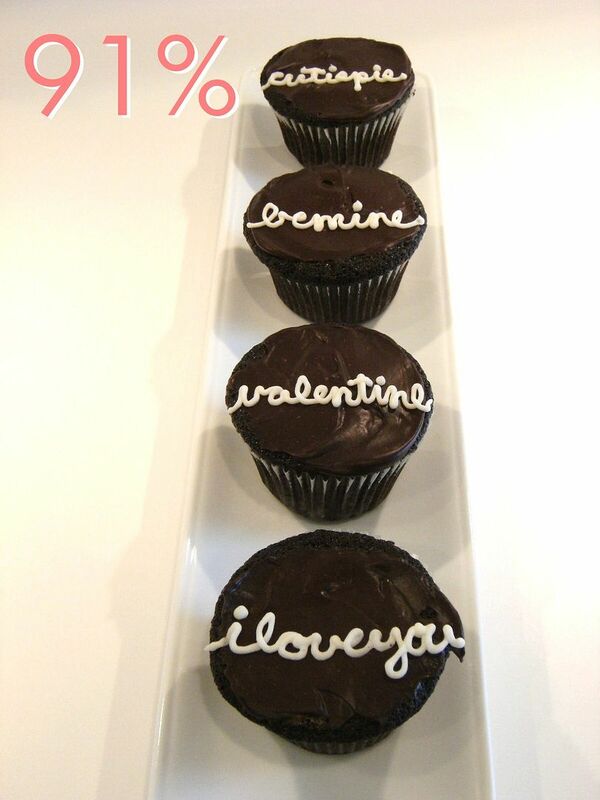 love the idea of your filled cupcakes, but who do you get the innards in there? Thanks so much for your beautiful and inspiring blog!! 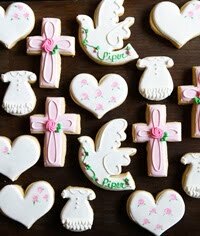 I love your sugar cookie recipe and use it often. I just can't get the royal icing to work. HELP! It doesn't look pretty like yours. I also need some help with consistency. I'm missing that find line between too stiff and too thin for outlining cookies. I've always wanted to ask - "the consistency of syrup" - do you mean cheap syrup or real maple syrup? Seriously, I have both and they are so different. Stop laughing at me. I have consistency issues. Stop laughing! 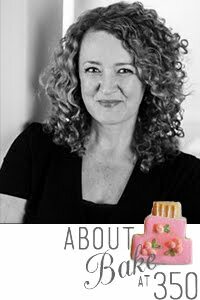 Let me start off by saying I am pretty new to your blog (but I have seen many references to it on We Are That Family) AND, though I love to bake, I don't know much about decorating cakes and cookies. That said, I made some spritz cookies recently and added sprinkles. I put the sprinkles on before I baked the cookies. The Sprinkles looked melted. Do I have to put them on before I bake them or would it work to put them on right when them come out of the oven? It seems like they would just fall off- but you tell me. Thanks! I look forward to reading more of your blog. Bridget i would totally agree with you on Mad Men! It's one of the greatest shows created for TV. I got hooked and i love it! Some people find it slow but the story lines are so good! I wish i was Betty Draper. Love this post - however, I must say that I was able to answer ALL of my decorating questions by reading your blog from start to finish! The handful of e-mails you sent to answer my "are you sure?" questions just cemented everything for me and I am so thankful! I apologize in advance, but I had to laugh at everyone that asked about a really good cookie recipe because I (feel like I have) tried them all and to me, your recipe is the best. And, may I just say, GOOF-PROOF! For me, it comes together like buttery play-doh and ALWAYS rolls perfectly - although I never use flour or powdered sugar because I roll my dough between two pieces of parchment - it helps me lift the cut shapes off because I am able to just slide my hand under the paper and lift my shapes off with my other hand. As for the consistency questions you get - I have to say that I just "feel it" when my flood icing is just right. I have recently learned not to beat the heck out of my royal icing (STOP when it begins to shine in the bowl!) so I'm having terrific success with my piped royal icing. I just cannot thank you enough! I have never enjoyed baking cookies as much as I do now that I've learned from YOU! Much love and continued success! Quick note about getting cookies onto the pan. I also roll between two sheets of parchment paper - then chill so the dough is pretty stiff. I lift one sheet of parchment off, then just place it back on top - flip the dough over and lift the second sheet off - then cut...the dough hangs on (but doesn't stick) to the cutter, so I just take it to the sheet in the cutter. And I use the Joy of Cooking "Iced Sugar Cookies" recipe - but not all versions seems to have it. I am continually ticked off that my decorated sugar cookies look exactly the same as they did when I was seven...I think a video tutorial would be so helpful! I don't even know if I'm holding my icing bag correctly? PS - I'm on the bandwagon of Houston bloggers hoping you'll hold a little class for us. You could even charge. Everyone wants your help! Love the chance to get questions anwsered since I'm not a good cookie baker. Here are my few from when I used your sugar cookie recipe. 2- Since I'm not talented to decorate them pretty by filling, what's a good frosting recipe to use for non-filling? Like if I want to decorate the cookies with my kid and candy. How thick should dough be rolled? I know when I make cookies and pies, I am always guilty of rolling too thin. Do you use a guide (the bands on the rolling pin) or just eye-ball it? I love these pink cookies at the top of the post. Blessings! I'm often try to do too much in a little amount of time, example bake and decorate three dozen cookies and start project at 8pm when I need them in the morning. Good think I'm a night owl, but really I stress myself out. I would love to plan better! How long do you give yourself if you need to make 3-5 dozen cookies? I so need to organize my time better, Please Help! Love your blog. Have a favorite sugar cookie recipe from a 1960's Betty Crocker cookbook and am a butter cream frosting maven when it comes to topping them. I do want to start piping the edges and see about thinning my frosting just a bit so my cookies can at least approximate yours. Am looking forward to your answers. PS LOVE the picture! I would love a beginners tutorial on icing cookies. See, I don't ice cookies. I just don't really know how (at least to do it well). I'd love to know how to get started! 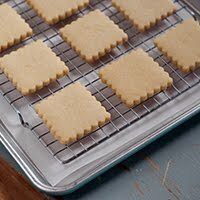 Once the cookies have been cut with the cutter, how to transfer it to the cookie sheet without ruining the shape? 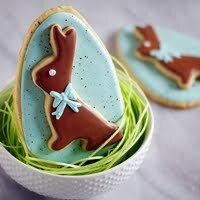 #2 - On decorating a baked cookie, you said to mix egg powder and water and paint on the liquid then add glitter. What is the ratio of powder to water, what should the consistency be? thanks so much, this will help so much! 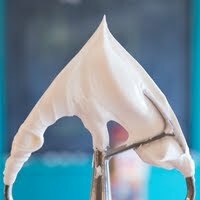 One more question, how long can you keep royal icing in the fridge before you need to toss it?